This post sees a few glimpses of great talks of inspiration that I have heard from great gurus that leads to enlightenment. The word GURU has been formed by joining GU which means “darkness” and RU, “that which dispels” . So the literal meaning of the word Guru is one who eliminates darkness or one who enlightens. When we assign the function of “light” in our day-to-day activities, we simply say that the light removed darkness. Now we can see every thing in a room with its help. But when the mind is troubled and cannot decide between the right and wrong, a kind of darkness encompasses the mind or blocks the mind from clarity. Here we need the aid of an inner light to show us the way. This we call as Conscience. This conscience or illumination dispels the shadow of confusion and promotes clear action. But this Light of Consciousness which is called as “SELF” in Upanishads cannot be understood or felt by all. Association with a spiritual Guru frees an ordinary mortal from the clutches of internal darkness. The Guru drills him for mental tranquility. The role of Lord Krishna can be compared as a Spiritual Guru to Arjuna whose mind was raging with conflicts in the battlefield of Kurukshetra. Sri Krishna tells Arjuna to empty his cup and seek HIS refuge alone. According to spiritual tradition, mind is under the influence of three gunas. The lowest Tamas is the force of inertia, dullness and lethargy. When the mind is active, alert and ambitious it is under the sway of Rajas. Sattva, the third force brings calmness, understanding and happiness. Qualities to be developed for mental clarity and happiness. Great Gurus say that we should focus on attaining more of the Sattva qualities which will promote the mental calmness in every activity. Such calmness can be found in devotional music, contemplation and meditation. Control of senses was another point highlighted in several talks by great Gurus. These senses are like wild horses that upsets our mental balance. This can be controlled through the exercise of willpower. Other qualities to be developed are Fearlessness and Patience. It was said in one of the talks that instant experience of God is not possible like drinking an instant coffee. Great teachers tell us to patiently continue our contemplation, prayers and disciplines and not to expect immediate results. Another quality to be developed is Faith. We are not born with a mountain of faith.But to achieve our goals we need to have a faith in God and in our potential. Faith must be put into action. We have to think that God exists and listens to our prayers. HE is within our hearts , and we can grow closer to HIM through constant and steady effort. Then comes Bhakthi or Devotion in the form of divine love. Our love for worldly things keep on changing. Because we have no end for desires and if one is fulfilled, the next one pops out. Our love towards all relations – love towards the family / parents/ friends/colleagues etc are all based on expectations. But if we pray “O God, I want to love you without any expectation”, then God runs to us and says “Yes, I am waiting for your love”. Excellent article, well researched and topical on this auspices day…God Bless you Anuradha ! 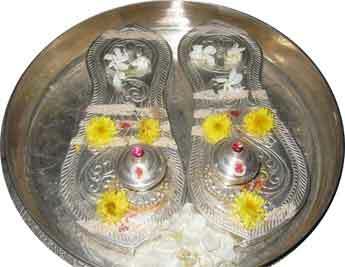 Shri Gurubhyo Namaha! Hara Hara Shankara, Jaya Jaya Shankara! Thank you and God Bless you on this Happy Guru PoorNima Day!